The TEMPLAR is halfway between the MERCENARY and the LEADER. 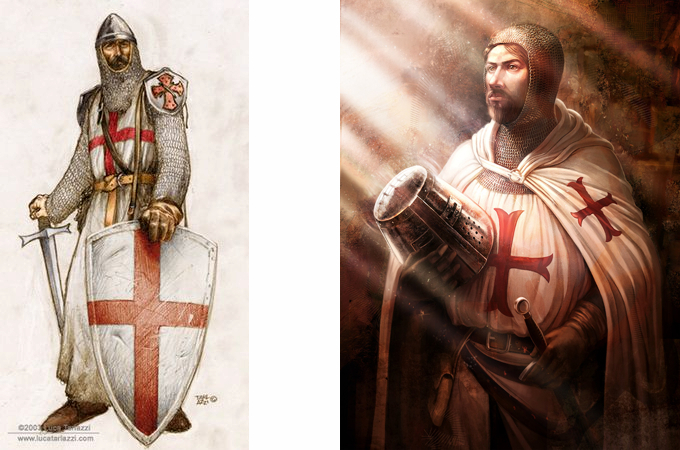 Same armour, but the mercenary’s is ruined and the leader’s is luxurious, the templar at the end of the 13th century is quite rich so the armour must reflect this. Obviously all white with red crosses. Big shield on the ground, so the symbol on the tunic can be seen, sword resting but in his hand. 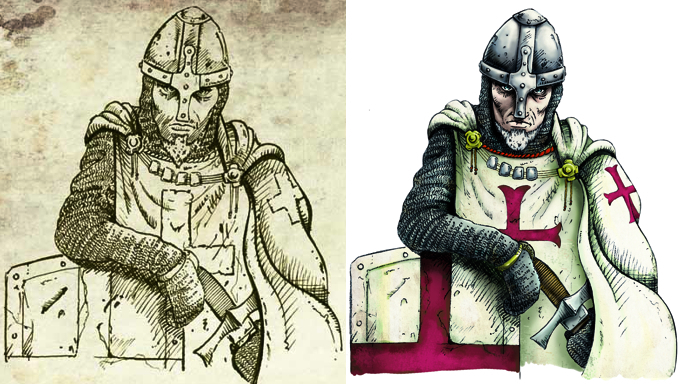 Detail: if you agree, I would make the templar a bit older, around 45 years old, so with some wrinkles and a graying beard. Ok, just remember what I told you about in the LEADER: I can’t have a mercenary and a templar too different in sizes! If necessary cut them all in half. Ok for all the rest. I’m not convinced about the “simple and straight” crosses…I have to look at them and then tell you something about it tomorrow morning. Please, can you please put the cross on the chest and the shoulder like in the image attached? Ok, so here I looked for some differences with the mercenary. I thought that the tax collector needs to seem more menacing, but without looking like a warrior ready for a battle. Also because he has to collect money from people who will not try to kill him! But you never know, so he had better be equipped. I chose a heavier character, with a padded armour, more scenographic but easier to wear. I tried to draw a haughty man rather than a warrior. 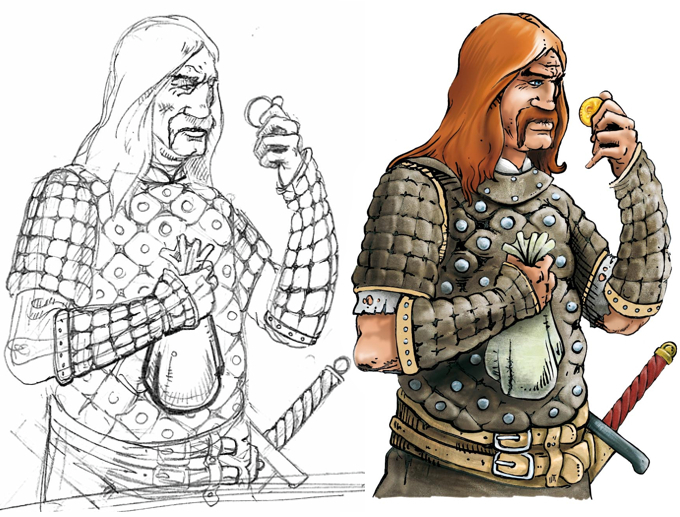 The tax collector looks like a Viking with long hair and the moustache, but let’s leave it like this as it could be a foreigner who is paid to do this dirty job. Everything has arrived, do you know that even I had thought about the Viking? (but I hadn’t wanted to tell you). Shall we change it or leave it like it is? An elegant dress as he has to go to the rival king’s palace. Obviously a parchment roll with a red wax seal with a regal symbol. I don’t know if you want to put him in a pose like the heroine. I don’t think that white clothes were used for diplomats at the time, maybe a green and lilac is better, but no strong colours like red (orange is better)…no blue, a pale blue is better. Diplomat: not much to say. I don’t want him to be like the heroine, I preferred him “on a mission”, almost protecting the parchment. I put the stick to balance the figure and give him an extra symbol of richness. I wanted to show you the colour scheme I would like to use for the diplomat, if you agree, with the image that inspired me. I know you wanted him pale blue, but the contrast pale pink, black (dark grey) and the white of the fur seemed nice. Let me know. Only one thing…can you rotate the pale green on the V of the chest towards the outside trying to “meet” the colour on the stomach….it seems like the stomach is separated from the rest of the upper body. I’m working hard because I had stopped for a while, and I had wanted to do more. 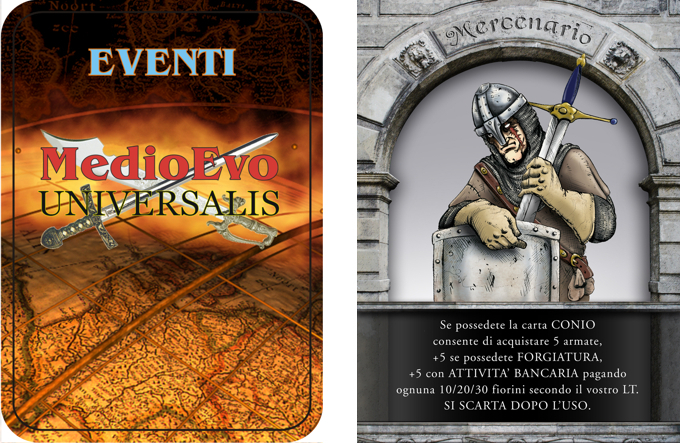 I will correct the stomach and continue the merchant…. Here I have a doubt: are the scales too big? Shall I put something on the plate and unbalance them (it would look better) or shall I leave them empty on the same level? OK FOR EVERYTHING, everything is perfect. The only detail: can you put some spices on one plate of the scale and a small weight on the other one. I would avoid chili and maybe consider cinnamon (brown/yellow sticks on the left) to be kept in hand. A very delicate powder or at the most in grains such as in the other bowls. If you could make the arms of the scales a bit thinner it would be better as I have some problems with the proportions. Can you add some details on the belt to make it more complete? I was looking at the sketch and the coloured version…they are different, so I presume you redraw it from scratch…but you changed too many things: you made the arm that holds the scale too long…if the sketch was out of proportion, the final drawing doesn’t fit on the card. The head is too small compared with the rest of the body, if you can make it bigger please. Ps. 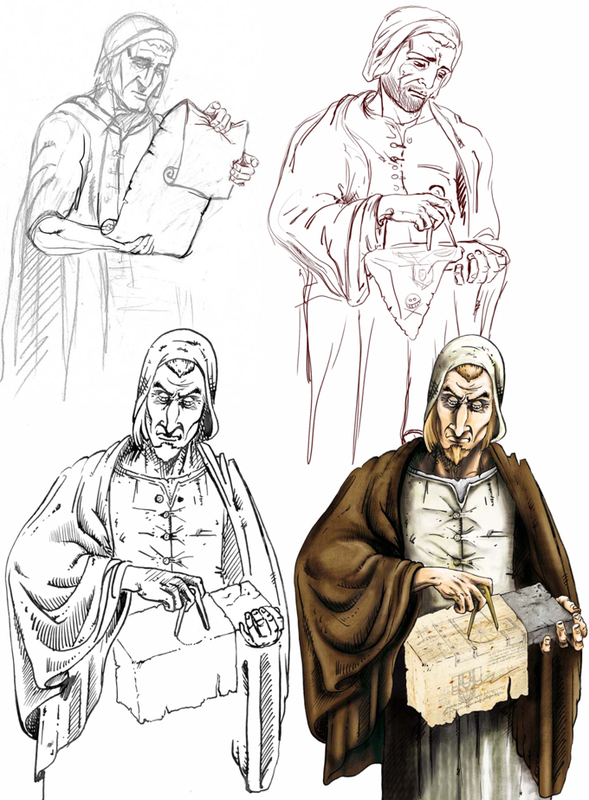 If you look at the sketch of the diplomat compared with the final drawing, you will notice that the last one has the head too rotated in an anticlockwise direction (I mean the ear close to the shoulder) in an unnatural position, maybe we should straighten the head a bit. 1-if he was selling radishes he probably couldn’t afford those clothes, there’s no problem, but I wanted to know if I had to put the sticks in his hand and the powder on the scale. 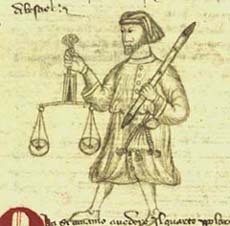 I was thinking of putting the cinnamon sticks on the scales and in his hand, as he is adding the sticks to the scale until he reaches the right weight. You tell me, it’s the same. The important thing is that he earning money…. 2-I will make the arms of the scales shorter, no problem. 3-I didn’t make the holes on the belt on purpose, the buckle is also missing, but I did it to change the model, this is one of those which enter the buckle and then fit in. You tell me what to do. 4-I didn’t redraw diplomat or merchant, it’s just that the pencil drawings are usually sketched, I don’t usually waste too much time with the proportions or anatomy because if you don’t like them I have wasted time for nothing. So I often correct things before colouring. Sometimes it can happen that some mistakes remain. 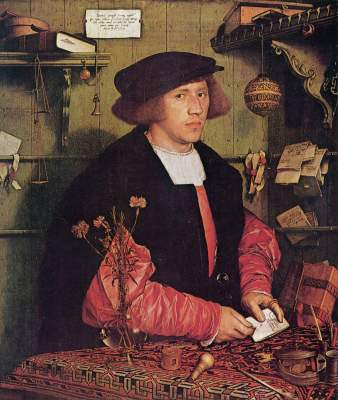 For example in this case the merchant’s arm is too long, but only slightly. The pencil version was more wrong because the arm is far too short and attached too low. If you look carefully he doesn’t even have the right shoulder! Holding the arm up the shoulder should almost touch the chin, this is quite a big mistake I noticed later…there are these corrections in almost all of the pencil drawings, I just don’t tell you I do them, I simply do them. In this case if I make the arm longer the character becomes too small to fit in. I hadn’t thought about it, so I will shorten the arm slightly. You’re right, the head is too small, I will make it bigger. 5-the diplomat: the pencil drawing is completely out of proportion. The head is enormous, unnatural. But what I liked less was the hunchback. 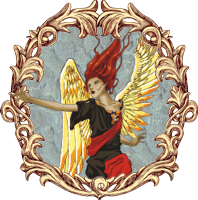 The coloured version is ok, if necessary I can easily rotate the head. I think it would be better, not because it is unnatural, but because it would create a better status, because a diplomat must always go around with his head high, right? Sorry if I’m so meticulous, but these cards are really important for me, and you’re doing them really well, so I wouldn’t want some mistakes. 4-ok, I get your point. Ok for arm and head. Don’t worry, you’re not too meticulous. I know how important this is for you, and it is for me too, which is why I keep changing things that don’t convince me. By the way, here is the diplomat’s head completely changed, I think it’s better like this, what do you think? 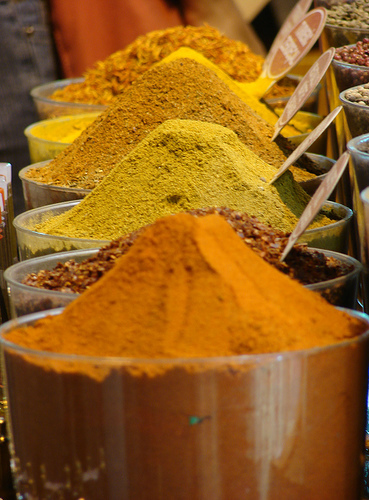 Here is the spice merchant (cinnamon). I would have wanted to show the shape of the rolled cinnamon more, but the sticks are so small that I couldn’t do more. Here you can do what you want, I have no particular idea, apart from something stolen in his hand to make people understand who he is. I’m thinking of a European character. I’m trying to follow my idea of making each card as different as possible, so I completely changed my idea of thief. I wanted to create a dark character, mysterious and intimidating, with a dagger in his hand…but then I realized it would have been an assassin with a pouch of coins in his hand. Too similar. I avoided the bag too…so I thought of a character more mysterious than the assassin, almost hunchback, without an athletic body like the assassin. Thief ok, you choose the gem. About the thief: I decided to redo it, I didn’t really like it. I will send you another sketch and send it to you, then if you prefer the old model I will do it that way. 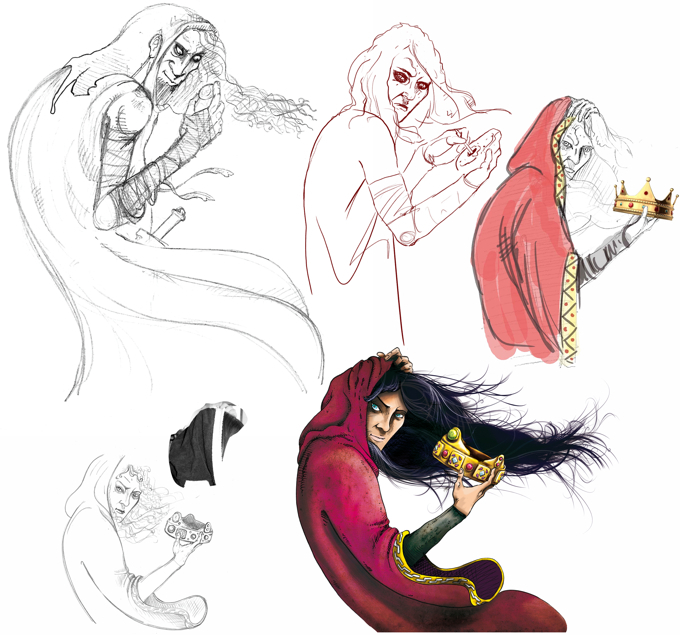 I’ redoing the thief. The position is the same as the old one, almost trying to hide from the observer., very mysterious. The drawing is more in proportion, the face is more in evidence, I wanted him to hold something to break locks, but I don’t know what to connect them to. Maybe chests or locks or doors…but I don’t think it’s possible, if you have an idea. I’ve already prepared a version with a cloth full of gems such as rings, necklaces, stones etc. I’m waiting for your answer before I continue. -the old thief was a gentleman so I was thinking of a guy with one hand that’s taking his mask off, and the jewel in the other hand. -or another idea, since the thief in the game steals other cards, I thought he could hold something such as a crown, to show the importance of the robbery. Here is the final version of the female thief. Dominican ok, even though I’ve been told that they used oil on their hair, but it doesn’t matter. If you ask me to chose, I prefer the slimmer version. I had noticed that the line was too curvy and exaggerated, but I left it. I think it is important to leave it to underline the type of character, she’s a thief, she mustn’t only be slim, she must be ELUSIVE. The exaggerated line makes the figure move, compared to your figure, who seems still, standing. Mine seems to be moving silently and quickly backwards. The wind, moving against the movement she’s doing, the long hair, the smile, the mysterious gaze…they seem to be creating a SCENE, not a still image. I hope you understand, I’m waiting for your advice. If you want some changes, ask, it’s not a problem. I think you’re right, but I would rather have an image that is closer to reality…so, let’s go halfway: don’t straighten the back too much and don’t leave it too bent, like in the attached image. Let me know about the frames. 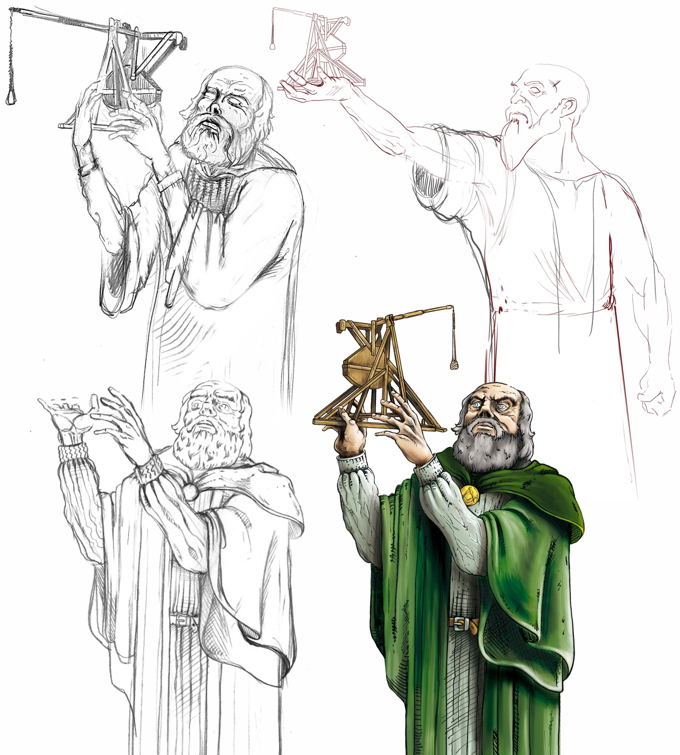 ARCHITECT: it’s a basic version of the genie…maybe it would be better to put a parchment with a project for a building and a compass in his hand. For the clothing you could look at the old card. I tried putting a parchment that the player could look at, but I didn’t like the result (here they are anyway). I discovered on internet that in that period architects used a board to keep the sheets of paper up when they were drawing standing up. I thought about doing it like that, with a compass in his hand, to underline his profession. I’m satisfied of architect 3, you tell me. The architect is perfect, but the arm with the compass seems too short…I think it will be sufficient to expose the elbow more. Ah, I was forgetting: the architect has a piece of paper which is too long, please make it smaller (the part that drops towards the floor). Architect….the clothes of n.3 are 100% appropriate…but the board he is working on seems a bit too small, but if those are the sizes you found on internet, it’s fine with me….remember the sizes of the card…the paper can overflow towards the bottom of the card (it will happen on most of the cards). here are 4 finished characters. I’ve been working on them all week, but I wanted to send them all together so you could enjoy them. I hope you like them, let me know…. 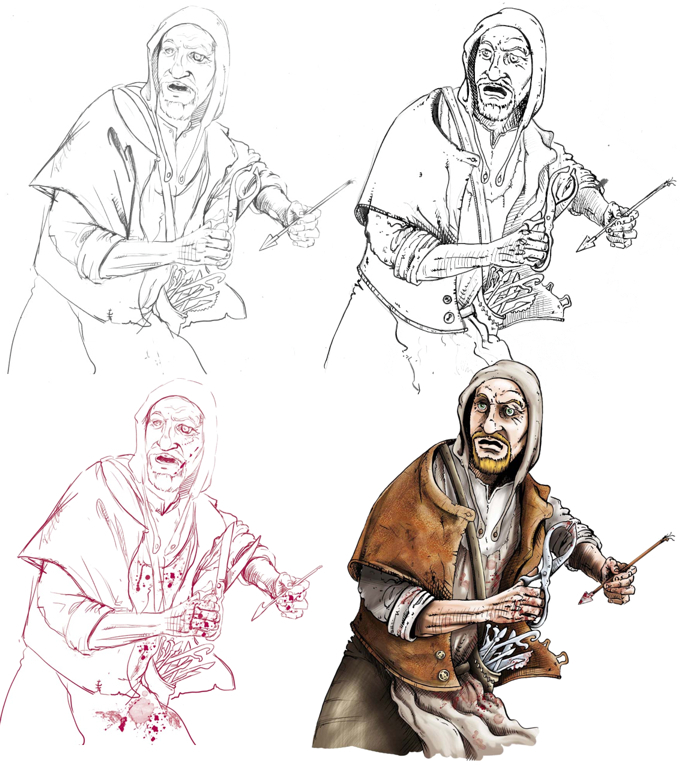 Hi Omar, thank you for the drawings, I received them this morning…I was very impressed with the architect, the inquisitor and the surgeon…wow it’s a pity I’m going to have to put them in proportion for the cards, the details are incredible. Surgeon and the architect are perfect. The surgeon of the time. wow!! I will never change it even if you ask me. The surgeon is your masterpiece, maybe he doesn’t look like a doctor, but more of a weirdo. The surgeon is really cool…and yes, less blood…I don’t know if you want a tong instead of the scissors in the right hands and a broken arrow with a bloodied point in the left hand…I don’t think the big scissors are right. What is he holding? There wasn’t much during the Middle Ages, maybe a parchments with pictures? The compass yes, the sextant no (there was still the quadrant at the time). let’s remember the space on the card, but he should fit if I start from the belt and let the assault machine overflow a bit…shall we take the belt away? Do you want to put the genie as it is? In that case the belt is behind the frame and you can’t see it. If not let me know so I can put the belt right. Genie n.2 is ok, but I have to think about it…but let’s fold the arm so that the model of the trebuchet is level with the head, otherwise the proportions aren’t right. There is something not right about the perspective of the trebuchet, but once it is reduced nobody will notice, so the genie is fine as it is. The drawing is less precise than the others for now but this is the pose, if it’s ok. I will have to lower the book, so the cross is more visible. 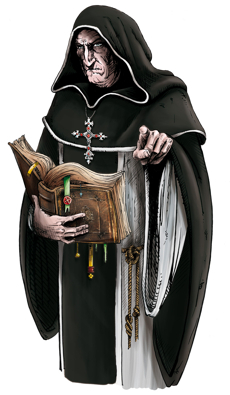 The inquisitor has a face like a dead person, it’s not ok…I don’t know…the rest is perfect. I redrew the inquisitor’s face, you’re right, it wasn’t ok before! I hope the menacing look has remained, a little rounder maybe, tell me what you think. The pose is ok, let’s see what comes out when you finish the drawing. 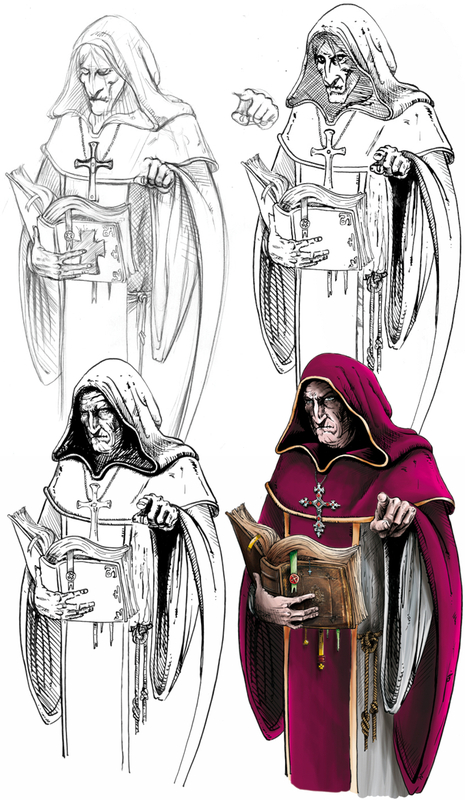 The inquisitor has a shadow of the cross on the chest which flattens it and changes the perspective, I think the shadow must be rotated, taking it away from the right arm and putting it on the left arm. Here is the inquisitor’s cross if it’s ok. 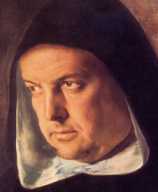 I showed your last 4 masterpieces in the forum and somebody made me notice that in that period the inquisitors were almost all Dominicans with white tunics and black cloaks. So, without changing everything, maybe we could change the purple into black and the inside of the hood could become white, what do you say? I suppose the image will become quite dark, but they are right. The critics then tell me that Dominicans didn’t use chords around the waist, that was typical of the Franciscan order, so we must eliminate it.